Community Directory Update - nurture. On October 31 Nurture completed a strategic planning process, resulting in the approval of our 2017 – 2020 Strategic Plan. During the planning process, we realized that the way we’d been going about the Community Directory – piecemeal, with limited funding and volunteer technical support – would not yield the truly transformative resource that our stakeholders have indicated is needed. More committed than ever, we are currently seeking funding to invest in the professional expertise needed to create a truly responsive, user-friendly directory for RVA’s prospective, expecting, and new parents and the care providers that serve this population. Therefore, our time-table has shifted, and this project will more likely emerge in 2018. If you’d like to contribute to our efforts to connect the dots for perinatal health in RVA, please consider a gift on #GivingTuesday, November 28, 2017. Thank you for your continued support! In addition, a number of wonderful ideas were suggested, including having guest bloggers, creating a glossary to define terms/provide background information on perinatal health, having a system for verifying provider credentials, and creating a print version of the directory once it’s up and running. Some of these we’ve already considered, and some we will work to incorporate as we move forward with this project. Our goal is to launch a beta test of the Community Directory before the end of September, with exhibitors from our Birth & Baby Fair testing the system and providing feedback so we can improve the project as we go. If you would like to join the beta testing group, and/or offer your company’s support, please email us at info@nurturerva.org. 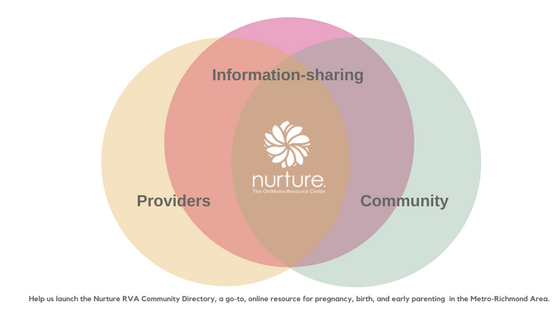 The Community Directory initiative came about as a result of interviews and surveys Nurture conducted with multiple community stakeholders, who indicated there was a need for a comprehensive, searchable, user-friendly directory of perinatal services. The estimated cost of getting the Directory to the beta test point is $5,000, all of which represents generously donated time and expertise. Going forward, in order for the Directory to be sustainable, it will need to be supported by the community. We welcome – and need – your great ideas and financial support as we work to make the Directory a truly useful and responsive resource for the community. Now’s the time to provide a greater level of information sharing between our community and our providers. For providers, businesses, and agencies, you will find a suggested annual contribution to sustain the directory once you finish registering your listing. Community members who wish to support this initiative may make a tax-deductible donation in any amount here. We thank J Ivy of J Ivy Graphics for his insight, guidance and expertise as we build this online directory. J’s time and talents are greatly appreciated and invaluable to this initiative. In addition to volunteers like J, we’ve heard from two of the local hospital systems expressing interest in joining us. Can we count on you as well? If you’re interested in supporting the directory as a volunteer, or have other suggestions for us, please email us at info@nurturerva.org. Becky Bales-Ward is a mom, marketer and mid-lifer. She’s a seeker of truth and believer in miracles. As a business school graduate of VCU and lifetime Richmonder, she’s excited to volunteer with the Nurture team to bring the idea of the Community Directory to life. Let’s work together to support RVA’s emerging families.